In case it's not clear, the graph is showing labor's share of total economic output. Steve goes on to make the point that if the Fed uses rising labor costs as a proxy for dangerous inflation, and tightens fast at the faintest whiff of such an increase, while doing nothing if the opposite happens, you will tend to see a secular decline in labor compared to capital. One more related fact: Apple has accumulated a staggering hoard of $100 billion, and it's increasingly clear the firm's management isn't going to give it back in the from of dividends or stock buy-backs. Instead they look like they'll invest it in other things, which means either accumulating even more money or squandering it on some boondoggle. This discussion gets rapidly technical, but on a basic level, here's the picture I'm forming in my head. Roughly speaking, capital has thoroughly beaten labor in the last 30 years, and has used the increased leverage to direct large and increasing profits to owners and managers. Because the small cadre of very rich couldn't possibly spend all this money, it resulted in a global savings glut, which in turn sparked huge demand for AAA-rated investments and thus a large part of the 2008 meltdown. Since then, the Lesser Depression walloped labor again, even harder, and now that the economy seems to be picking up, pointless accumulation seems to be accelerating again. I don’t know the magnitudes. I don’t think anyone does, and attempts to estimate would be very contestable. Globalization, communications, and cheap transport have certainly created “real” headwinds for labor bargaining power. Labor is not as scarce a factor as it once was. But then, for much of the decade preceding 2008, we had a “global savings glut”. In the US, capital was not at all a scarce factor, Wall Street was cheating to invent means of deploying it. 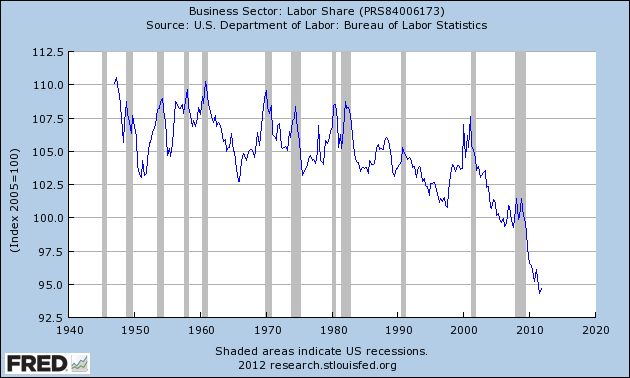 That should would have militated towards to an increase in labor share, but we certainly didn’t see that. The main point in favor of trying to increase labor share, and thus restrain corporate profits, would be to prevent this pointless accumulation. Worldwide, vast hoards of money are inherently unstable, and that money would be less dangerous placed in as many hands as possible. Labor’s share began a secular collapse sometime in the 1990s, leading to a large run-up in loanable funds. That run up put large downward pressure on the natural rate of interest. This was offset for a time by finding ways of expanding the pool of credit worthy borrowers through financial innovation. Once a major set of those methods was revealed to be untenable [RLC: as in, financial apocalypse] the natural rate of interest collapsed not only below the Funds rate but well below zero. The large gap between between the natural rate and the Funds rate put large downward pressure on aggregate labor demand resulting in the Great Recession. To have cleared the labor market with the pool of borrowers available in 2009, real wages would have had to make up for over a decades worth of missed decline. This was exacerbated by the fact that falling nominal wage disbursements (whether from pay cuts or layoffs) further depress the pool of eligible borrowers by raising real debt levels, requiring even further falls in the real wage. On the strict economics, that seems reasonable. Just why "labor's share" collapsed is the next question, and that's where Smith has some fairly wild theories.